Weather forecasts these days are hi-tech: satellites orbiting the Earth continually watch the current weather and feed this information into some of the largest supercomputers in the world. But satellites can’t give us a complete picture of the current weather and, to fill in the gaps, we use a seemingly low-tech solution: helium balloons. Thousands of them are launched from weather stations around the world every day. Except that these balloons are anything but low-tech because dangling beneath each is a box crammed with miniaturised electronics that measures the atmosphere from the ground to 20 km or more above. Earlier this summer the YouTuber and atmospheric scientist Simon Clark visited the atmospheric observatory here at the University of Reading to film Dr Graeme Marlton launch a weather balloon and follow its journey up through the atmosphere. Simon has since uploaded the first of three videos that he filmed at the department. More of his videos on Simon Clark’s YouTube channel. Perhaps surprisingly, in the UK there is no accepted definition for a heatwave. The Met Office tend to use the World Meteorological Organization definition of a heatwave which is “when the daily maximum temperature of more than five consecutive days exceeds the average maximum temperature by 5 degC, the normal period being 1961-1990” [Link 1]. In the popular press the impression is gained that a heatwave is a hot spell lasting at least two days. In practice, the definition of a heatwave varies from country to country and, rather like a drought, it can depend upon the use to which the definition is being put. Thus humidity, minimum temperature and other meteorological factors relating to human physiology can also be included in a definition. The WMO definition presumably refers to the 1961-1960 period as this is the current standard 30 year averaging period used in many areas of meteorology. Arguably, the actual temperature itself should figure in the definition – the public might take some convincing that the South Pole might experience a heatwave! Here in Reading we have a weather station that has been operational on the Whiteknights campus since 1968 – prior to that records have been kept closer to the centre of the town along the London Road since 1901. The relative urban (London Road) – rural (Whiteknights) differences of the two sites make it difficult to directly compare day-to-day temperature measurements between the sites. A period of five or more consecutive days on each of which the daily maximum temperature is more than 5 degC higher than average for the period 1981-2010. The long-term average is calculated here on a day-to-day basis. There were just 3 heatwaves during 1968-1980 – of which the longest (and also that for the entire 48.5 years) was that lasting for 17 days from 22 June 1976. The second-longest heatwave lasted for just 11 days from 3 August 2003. During 1981-1990 there were 7 heatwaves, with 6 in the period 1991-2000. During 2001-2010 we had 10 heatwaves, with 9 since the beginning of January 2011. 16 heatwaves have begun during one of the summer months (June-August), while 14 have started at some time during March-May (i.e. in spring). The only autumn heatwave was the six-day long one starting on 28 September 2011, while there have been four that started during winter months – namely those starting on 11 February 1998, 11 December 1998, 15 December 2015 and 25 December 2015. So, we had a heatwave starting on Christmas Day last year. In fact had the temperature not dropped slightly on 23-24 December (the maximum temperatures were just 4.5 degC and 4.3 degC above normal on these days, respectively), December would have had a 16 day heatwave! The bullet points above indicate a tendency towards an increasing number of heatwaves – as might be expected in a warming climate. This is confirmed by Figure 1. Figure 1. 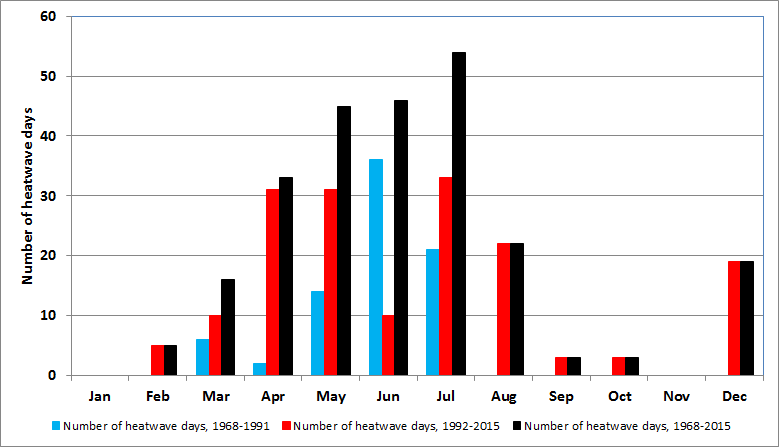 The number of heatwave days during 1968-1991 (blue), 1992-2015 (red) and 1968-2015 (black). Notes that monthly totals of less than 5 days are an indication of a heatwave spread over two months. Figure 1 shows that the second half of the period produced more heatwave days than the first half, the exception being in June due to the remarkable events of the summer of 1976 [Link 2] – which are still talked about to this day! 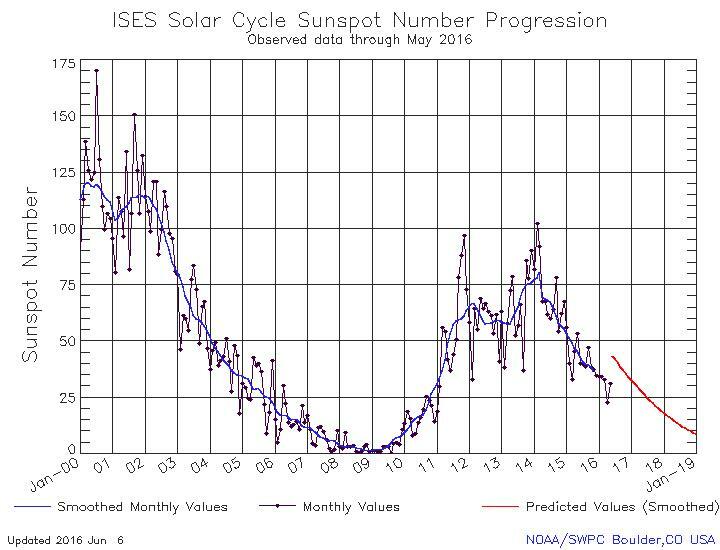 Moreover, the warmth of December 2015 also stands out –see also [Link 3], while both April and May seem to fare better than August. Figure 2. The number of heatwave days each year during 1968-2015, along with the ten-year running mean plotted on the final year of the ten-year period. Looking at the annual heatwave day totals (Figure 2) suggests less of a warming trend in recent years than does Figure 1. With the exception of 1976, there were less than 10 heatwave days each year until 1989; since then it is difficult to see much of a trend in the 10 year running mean count – 1989 and 1995 led to a peak in the running mean by 1996 but since then the running-mean has declined (slightly). Of course, in the public’s mind a UK heatwave is one with high temperatures, and not just large temperature anomalies – i.e. the South Pole argument mentioned earlier. If we examine the 35 heatwaves and rank them according to the average maximum temperature or the highest temperature achieved during the heatwave, then the results are those shown in Table 1. Table 1. Top nine of the 35 heatwaves, ranked by average of highest maximum temperature. This table highlights the appearance of the same nine heatwaves in both sets of rankings. Omitting the entry of 1976, then the other years that appear are those of 1983, 1989, 1995, 2003, 2006 (twice), 2009 and 2013. With only one year from the period 2010-2016 in the list, maybe this has fuelled the idea that we are having a run of poor summers without any heatwaves? Talking about science when you’re a PhD student seems like it should be an obvious prerequisite and an easy task. For some people, it is. For others, it is far more difficult. Reasons for this can be the intimidation of other scientists who you believe ‘know more than you do’ and so you feel your opinion isn’t valid. But these barriers need to be breached, and the sooner the better. As a member of Voice of Young Science (VoYS), (a network of early career researchers who stand up for science), I am encouraged to think critically about science and to feel confident in immersing myself in scientific discussions whilst also challenging claims which I think are unreliable. This can be a daunting task, but it is a worthy and rewarding pursuit, not least of all because it equips us with the confidence to talk about science. Voice of Young Science is run by Sense About Science, a charity that aims to put science and evidence in the hands of the public. When the VoYS network suggested creating a Weather Quiz to address misused and sometimes misleading meteorological terminology used by the media, it seemed like a fantastic opportunity to get involved with some of the great work that they do. The aim of the quiz is to test your knowledge on the definitions and details of ‘well-known’ meteorological terms. That is, terms we are familiar with and have a vague notion of the definition, but which are not necessarily recognised as real or correct by meteorologists. And herein lies the problem. We all know what a heatwave is, in the sense that it is a period of warmth, but I would have no idea how to identify a heatwave on a technical basis. So, the question here might be: does that matter? When the media uses the term heatwave, and they’re just telling us that it’s going to be warmer, does it really matter if we know the details? The answer to both of these questions should be yes. Not only because it is frustrating for meteorologists, but because it represents somewhat careless reporting on the side of journalists, and shows a clear misdirection or miscommunication of science to the public. Although meteorology is not my field of expertise (I’m in the School of Biology at the University of St Andrews), it is still something that affects me as a member of the general public. In fact, a few months before I contributed to the project, my friend and I were discussing what exactly is meant by the term ‘80% chance of rain’ (which I therefore made an effort to include in the quiz in case anyone else has difficulty with this one as well). This is one aspect that I felt needed clarifying, but there are others where the media just misuses terms completely (I would give more detail here but obviously I don’t want to ruin the fun of the quiz!). Working on this project was a real eye opener, and I truly appreciated the chance to make contact with meteorologists who made me aware of just how many terms are misused, made up, or are misleading in the media (and not all of them made the cut, so there are still terms out there that we weren’t able to address in our quiz). What’s more worrying is that I was not previously aware of the extent of the problem before engaging with the project. Further to this, other people were aware of the issues, but perhaps felt that it was unimportant, or not their place to say, or not worth the effort. However, it is vital to encourage scientists, early career or not, that it is important, it is your place to say, and it is definitely worth the effort. VoYS provides us with such a valuable platform where we have the opportunity to clarify and address the issues of how science is reported, benefitting scientists and members of the public in the process, and even improving the quality of media coverage. Meteorology is not my specialist area, but I was still able to engage with this aspect of science by simply understanding where the problems were and how they could be addressed. With help from early career researchers who are indeed meteorologists (including those at the University of Reading), we have been able to produce something which will hopefully not only highlight the issues with how the weather is reported in the media, but also highlight the need for scientists to step forward with other issues in their own field so that we can continue to address the misrepresentation of science. This may seem a strange question, but it was prompted by the sight of flowering daffodils alongside the A4 through Maidenhead on 12 December 2015 (Figure 1). In order to bloom, daffodils and other spring-flowering bulbs must be exposed to a drop in temperature after the previous flowering period – often a temperature below 8 °C is quoted for this threshold. However, once spring arrives it has been shown that a cool/cold winter will lead to a delayed onset in flowering (Seasonal weather, by Lionel P. Smith, published in 1968 by George Allen and Unwin Ltd). Warmer weather in spring has, according to plant scientists at Kew Gardens and Wakehurst (Sussex), led to an earlier onset of the flowering dates of daffodils in recent years: in the 1980s daffodils commonly flowered around 12 February, but by 2008 this date had shifted to 27 January, 16 days earlier. In the 1960s the flowers appeared some 3-4 weeks later than they do nowadays, so an appearance of the flowers in mid-December is remarkable. Has the warmth of recent weeks been to blame for the flowering observed in Maidenhead? Weather conditions in autumn and winter so far (17 December) have been unusually mild. In Reading, at the University’s climatological station, just two air frosts have been recorded since the beginning of September (see Figure 2) while the mean air temperature has been about 5 degC above average for December so far. Figure 2. Red: mean air temperature for 1-17 December during each year from 1918 to 2015. Black: The number of air frosts recorded during autumn and winter up to 17 December for the same years. Dashed lines show the 30 year averages for 1981-2010. Note that the air frost axis on the right has been reversed so that a low incidence of air frost and higher temperatures tend to coincide. Observations made at the University of Reading. Following a mild November (the third mildest in the period 1908-2015) the first 17 days of December have been the mildest on record – see Figure 2 – by a truly remarkable 1.1 degC. The average temperature during this period of 10.6 °C in 2015 is similar to the mean temperature normally to be expected around the beginning of May! During the afternoon of the 17th, the air temperature rose to 15.5 °C at the University, the second highest ever recorded here in December (after 15.8 °C in 1985). As mentioned earlier, winter bulbs usually need a period of cold weather in order for the shoots of the bulb to sprout and produce flowers; such a spell has not occurred yet – since late September average temperatures have remained fairly constant, give or take a degree or so (Figure 3). The only exception to this was a cold spell around 20-25 November, when the two air frosts and the only snow shower of the season (so far) occurred in Reading. Figure 3. 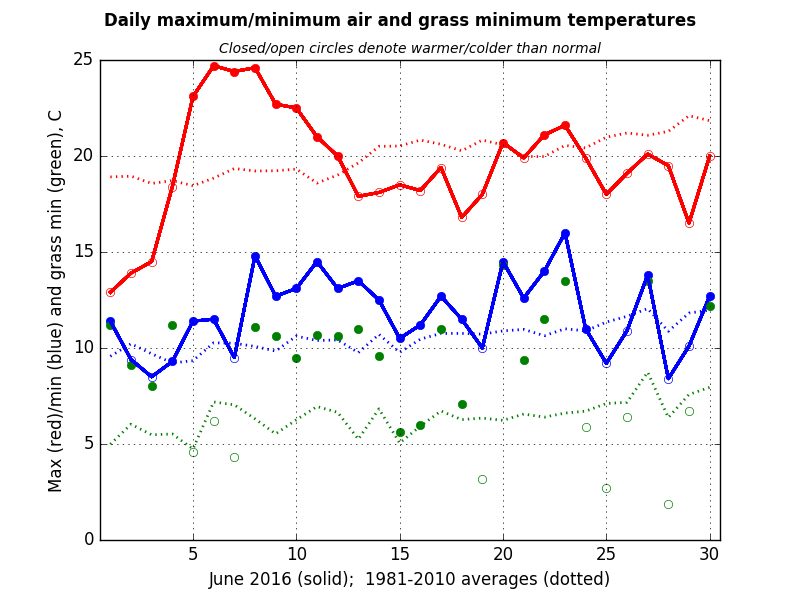 Five day running mean temperatures °C for 2015 (blue) and the 1981-2010 average (red) at the University of Reading. Of course, soil temperatures may also be playing a role in encouraging the bulbs to produce growth and flowers. Table 1 shows the anomalous warmth of the soil during December so far. Table 1. Soil temperatures during 1-17 December 2015 in Reading. The soil temperature averages for the month of December 2015 so far are currently averaging close to 4.5 degC above average at daffodil bulb depth; in fact, the soil temperatures so far this month are currently those normally seen in mid-October/mid-April (at 10 cm depth), late-October/late April (30 cm) and mid-November/mid-May (100 cm). Peak temperatures at depths of 30 and 50 cm this month have also exceeded anything previously measured at this time of year since observations at these depths began in 1910 and 1971, respectively. This unusually persistent warmth has been the result of a higher-than-normal frequency of winds from the south-west quadrant (a mild direction in autumn/winter) across southern England – see Figure 4. With Christmas fast approaching, there is no sign of any change to this pattern of winds and temperatures. Indeed, the chances of a White Christmas in Reading seem very slim. Possibly a rerun of the Christmases of 1911 (when temperatures rose to 15.0 °C on Boxing Day) or 1935 (when the temperatures reached at least 10 °C every day from Christmas Day until New Year’s Eve) might be more likely this year? 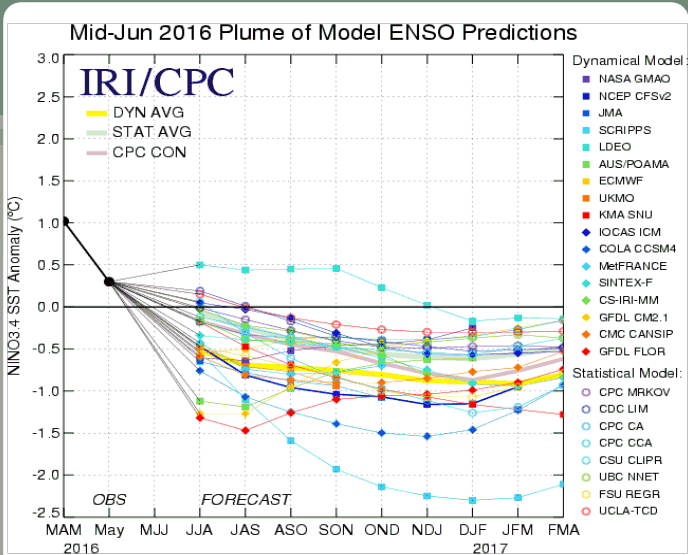 Even another air frost looks unlikely in Reading before the start of 2016. Figure 4. Wind rose of winds at the University of Reading based on observations every 5 minutes during 1 November – 16 December 2015. Mean wind speeds: 0-2 m/s (red), 2-4 m/s (magenta), 4-6 m/s (cyan) and 6 m/s and above (blue). Radial axis shows the percentage occurrence during the period in 30 degree-wide bands. Southen Africa has experienced an increase in rainfall during December to January (DJF) that contributed to an increase in annual rainfall of 32-41 mm/year per decade (1983-2010). We argue that this increase is linked to a strengthening of the Pacific Walker circulation and since this is most likely related to a decadal climate fluctuation we do not anticipate this trend will be sustained into the future (a recent reversal in the Pacific Decadal Variability index has coincided with a developing drought in South Africa). 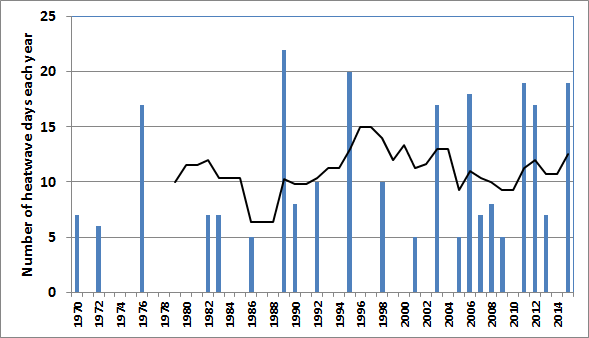 East Africa has suffered a decline in the “long rains” (March-May, MAM) over the past 3 decades. 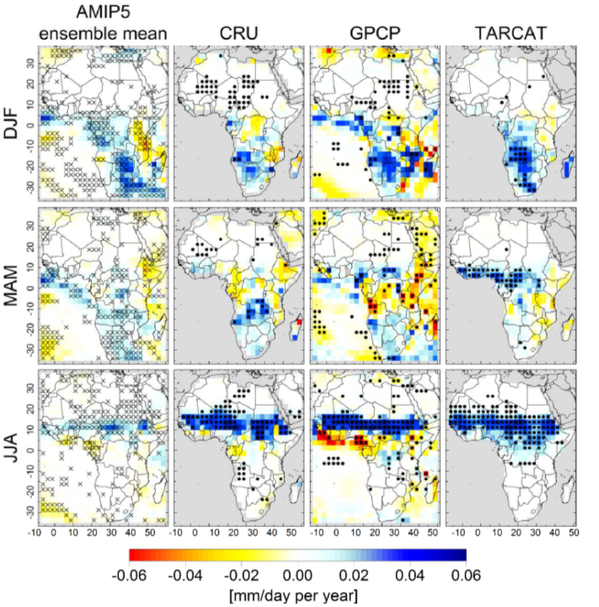 New research shows drying in this region is unusual in the context of the last 2000 years yet climate model simulations struggle to capture this rainy season. Sahel rainfall has increased by 29-43 mm/year per decade (1983-2010), in particular during the June-August (JJA) wet season. Recent research has implicated increasing greenhouse gas concentrations as the primary cause of this recovery in rainfall from the 1980s drought. Particulate aerosol pollution and amplifying feedback loops from water vapour in the air are thought to also play a role. Figure 1: Rainfall trends (in mm/day per year) for 3 seasons over the period 1983-2008 in (1) atmosphere climate models (AMIP) that are fed with the observed sea surface temperature and sea ice, (2) the Climate Research Unit (CRU) rain gauge dataset, (3) the Global Precipitation Climatology project combined gauge and satellite dataset and the (4) TARCAT satellite-based dataset. See Maidment et al. (2015) for more details. In our analysis, we excluded datasets which contained unrealistic jumps in the time series (attributable to changing coverage of rain gauge measurements or other factors). For the remaining datasets, the simulations broadly capture the observed changes in rainfall in the regions outlined above indicating that they can be explained by changes in sea surface temperature, the radiative forcings or a combination. They also add confidence in the robust nature of the observed rainfall trends. Projecting future climate change requires fully coupled climate simulations in which the ocean temperature and circulation are free to vary (unlike in the AMIP experiments we used to assess current changes). It is important that the seasonal characteristics of rainfall patterns simulated by these fully coupled models are realistic. This requires improved understanding of the physical processes that determine the climate in key regions such as West Africa and the Horn of Africa which involves combining satellite and conventional observations with detailed modelling as for example planned under current missions such as the DACCIWA project. “Persistent low cloud, spells of fog, minimal amounts of sunshine and night-time temperatures more suited to September.” Such a description of the weather of the past ten days or so had me reaching for the records to try to place the recent weather conditions into a historical context. Daytime temperatures of 16.8 °C and 16.7 °C on the 6th and 7th at the University’s climatological weather station are not that unusual for early November; 16.8 °C was reached in November 2014 with 18.1 °C in November 2010 – the latter has only been surpassed in November by 20.4 °C on 5 November1938, 18.7 °C on 5 November 1946 and 18.2 °C on 4 November 1946 (figures taken from One hundred years of Reading weather). Even more unusual, the minimum temperature of 13.3 °C on Saturday 7th in 2015 has only been bettered on five nights at the University in the past century, and in fact some nights this month so far have seen higher temperatures than might be expected by day – see Figure 1. However, not only is it in Reading that the temperatures at the start of November 2015 have been unusual. Trawscoed in mid-Wales broke the UK’s November temperature record on Sunday 1st, with 22.4 °C being reached. The previous November record was also in Wales, when temperatures reached 21.7 °C at Prestatyn in 1946. On Monday 2nd this year Trawscoed reached 22.3 °C, while the Eskdalemuir observatory in Dumfries and Galloway had its highest November temperature on record at 16.3 °C. It is hardly surprising then, that average temperatures so far this month have been typically 3-5 degC above the average for November (admittedly this is the average for the whole of November, but nevertheless…) – see Figure 2. In Reading the average temperature of 11.9 °C over the first nine days of November amounted to the mildest such spell on these dates since 1982 when the average temperature was 12.0 °C – no other November in the 1908-2015 station record has started as warm as these two. These are in contrast to parts of northern Scotland where the sunshine total so far amounts to over 40% of the average for the whole of November. While there are still a lot of November days to come yet in 2015, it is worth noting that three dullest Novembers at the University have been those of 1962 (32.6 h), 1994 (34.6 h) and 2014 (38.2 h) – so maybe the present month might be the second successive dull November in Reading? Mean sea level air pressure so far this November has been slightly above average – and this has helped to give persistent low cloud and poor visibility. Reading has had two days with fog (visibility below 1000 metres) at 0900 GMT – November 2014 had 5 days with fog and there were 8 days with fog at this time of day in 2011 – so the total so far in November 2015 is not that unusual. But many mornings this month have also been quite misty and ‘grey’. So, with no air frost so far this autumn many will be wondering when it will turn cold. Statistically, the median (i.e. middle) date for the first air frost of the autumn/winter during the period 1925-2014 at the University was 3 November; only in 10 per cent of the years did the first air frost occur after 24 November. This blog was originally posted on 10 November 2015. It was reposted on 4 December following computer system issues. These were typical newspaper headlines earlier this week. So how did we fare in Reading? We did set one extraordinary record during this short-lived hot spell. We have daily temperature records for the university back to 1908, and as well as maximum and minimum temperatures these include the air temperature observed at 0900 UTC (10 a.m. in British Summer Time). Until Wednesday, the hottest morning on our records was Sunday 10 August 2003, when the 0900 UTC temperature stood at 28.4 °C. That particular day went on to become the hottest day on Reading’s long record, when the temperature rose to 36.4 °C later that afternoon. On Wednesday morning, our principal observer Mike Stroud could hardly believe his eyes when the dry-bulb thermometer at 0900 UTC stood at 30.6 °C, by more than 2 degC the hottest morning in Reading in more than a century. Fortunately or unfortunately – depending upon your viewpoint – extensive cirrus and altocumulus then largely obscured the Sun for the next couple of hours, and the temperature fell back to 29 °C, before rising quite late in the afternoon to the day’s maximum of 33.6 °C. This is of course by Reading’s standards a very hot day, but it ranked only fifth in the hottest July days on record (incidentally, displacing the hottest day of the legendary 1976 summer in doing so) … and it failed to make the ‘Top Ten’ hottest days since our records commenced. Had the rise in temperature from 0900 UTC to day’s maximum been more typical of previous heatwaves, we could well have broken the August 2003 record, and just possibly surpassed 38 °C. Only a little further east, the cloud cover during the morning was less thick, and this led to a pronounced east-west gradient in maximum temperature. A new UK July record was set at London’s Heathrow Airport at 1413 UTC when the temperature reached 36.7 °C, just surpassing the previous record of 36.5 °C set at the RHS Gardens in Wisley, Surrey, only nine years ago on 19 July 2006. Further west along the Thames Valley, 34.9 °C was attained in Maidenhead, 33.6 °C in Wokingham and here at the University, 32.7 °C at CEH Wallingford and 32.3 °C at Stratfield Mortimer, between Reading and Basingstoke. Some Met Office climatological stations report only once per month, so it may yet transpire when the returns arrive that somewhere was even hotter than Heathrow. A few locations are already known to have established all-time records last Wednesday, eclipsing the many notable heatwaves of recent years – we can include the summers of 1976, 1983, 1989, 1990, 1995, 2003 and 2006. What was all the more surprising was that Wednesday’s great heat was only the second day this year to have surpassed 25 °C. It will be interesting to see what the rest of the summer brings – more hot weather, or was Wednesday our ration of summer for this year? For more on notable heatwaves in Reading over the last century or so, including tables of the hottest days in each month and the ‘Top Ten’ for the whole record, see the newly-published One hundred years of Reading weather. With summer upon us we want to spend more time outdoors. However, as temperatures rise, conditions in cities may become uncomfortable. The urban heat island (UHI) effect, whereby cities are warmer than their surroundings, may exacerbate the higher temperatures. This UHI is amongst the best known phenomena of climate conditions in cities. A number of processes contribute to the distinct climates in cities and many environmental variables provide useful insights. One such variable is the surface (skin) temperature of the urban canopy (the temperatures of all the surface of all the different facets – roads, buildings, gardens, etc). It responds to the amount of solar radiation absorbed by the surface and the anthropogenic heat emitted (from buildings, vehicles, people), and serves as an indicator for the amount of energy being stored in the urban fabric which in turn is used to drive turbulent surface exchanges (heating the air and evaporating water). Given the significance of surface temperature to the heating of the lowermost atmosphere, where people live and work, it is a critical variable in many model parameterisations of energy exchange processes. For larger areas, satellite remote sensing techniques have proven extremely useful in observing thermal contrasts, e.g. urban vs rural differences for large cities at a spatial resolution common to thermal infrared satellite images (~ 1 km). However, thermal patterns are increasingly being investigated at more detailed scales, either using remotely sensed imagery from airborne platforms, ground based imagers or by decomposing mixed-pixel information in satellite imagery. Despite great advances in thermal remote sensing methods over the last three decades, many challenges remain when studying the thermal response of the urban surface in detail given the huge heterogeneity of the urban canopy layer (i.e. the three-dimensional urban surface composed of buildings, roads, vegetation and potentially open water surfaces). Given the 3D-structure of the urban surface the observed surface temperature depends on the viewing geometry and the solar position. This is referred to as thermal anisotropy. Shaded areas are usually much cooler than the average temperatures, while sunlit areas are warmer. The average surface temperature in a pixel (the smallest area a satellite ‘sees’), is a function of the shadows ‘seen’ by the remote sensor but also the type of facets sampled (Figure 1). Another challenge is the complexity of construction materials used in urban areas. These have a wide range of radiative and conductive properties. Hence they not only absorb and store the solar energy in different ways, but also require different corrections to be applied when processing the remotely sensed imagery. Significant amounts of research currently are focused on this topic. This week, a range of experts in the fields of thermal remote sensing and urban climate will come together at the University of Reading to discuss this hot topic. This is particularly important given current rates of urbanization world-wide, climate change and predicted increases in the frequency and duration of heatwaves. The Department of Meteorology hosts the Fourth International Workshop of the EarthTEMP Network, an initiative to stimulate new international collaboration in measuring and understanding the surface temperatures of Earth across all domains and methods. Previous meetings discussed the characterisation of surface temperatures in key land regions, extreme regions or specifically data sparse regions. This year’s meeting aims to addresses the ‘Complexity of Urban Surface Temperatures’. International scientists with various backgrounds have been invited to identify the key challenges in quantifying surface temperatures in urban areas. The workshop provides a platform for establishing new collaborations with the objective to advance thermal research in urban areas. The programme starts today, Monday 8 June, with a practical exercise taking place at University of Reading’s Whiteknights campus. This is followed by two days with a range of high-profile keynote presentations that will provide the background for fruitful discussions. Figure 1. (Upper) Brightness temperature image and (lower) visible image of an urban surface in central London with a westward view, taken in November 2010 around midday. The roof surfaces (~ 20 °C) are clearly hotter than the east-facing walls (~ 5 °C) and windows appear warmer (~ 9 °C) due to their differing radiative properties.